If you’ve been researching your first elliptical or if you’ve been looking for a replacement or an upgrade to your existing cross trainer your reading will have brought you, sooner or later, to a NordicTrack offering. Whether you’ve been looking for an all singing all dancing state-of-the-art model, or trying to find a high-quality entry-level machine, it’s most likely that you’ll have seen at least one or more suitable offerings from this large, highly respected manufacturer. It’s been some time since we took a look at one of the models from the high end of the NT range, so we got in the NordicTrack Commercial 14.9 to see just what comfortably breaking the 1k barrier will get you these days. Our test unit arrived in one piece with all the parts in situ as they’re supposed to be. Of course, this is to be expected, but it’s worth noting that packaging a 98kg (216.7lbs) bulky, yet relatively delicate, machine in such a way as it’s able to survive the journey through multiple courier networks is no mean feat. This is made possible because of the thoughtful and ‘no-risk’ approach NordicTrack has taken in ensuring that their product reaches the end customer in pristine condition. It can’t be cheap to do this and upon unboxing the C14.9 it’s clear that this manufacturer really has spared no expense on the packaging. And if they’re willing to go this far on the box, then what of the elliptical itself? Like all cross trainers, the C14.9 requires assembly. The good news here is that all the steps for assembly are simple and the manual is very clear with well-written instructions accompanied by clear diagrams meaning that this model doesn’t require professional assembly. However, there are quite a few steps in the process and a good number of them require greasing of various parts of the machine prior to putting them together (the required grease is supplied in the box) so assembly took us about an hour. The upside of this particular assembly process is that one can be 100% certain that all the parts that need to be well greased, will have been well greased. This, in turn, should avoid any unwanted squeaks. The downside is that it takes a bit longer to put the C14.9 together than some other units we’ve tested. All in all, it’s well worth the extra little bit of attention as our test unit was nigh-on silent during all testing. In our experience NordicTrack ellipticals have never been ground-breaking in their aesthetic design – and the C14.9 is no exception to the rule. This hefty front-wheel based elliptical looks neat and tidy and as if it’s made to work, hard. The colour scheme is various shades of grey with the only bits of colour coming from some of the buttons on the console and the console display (more on that in just a moment). It would appear that all the creative input has been channelled into the most important aspect of any cross trainer – how it functions. But perhaps there’s more to it than that. And perhaps NordicTrack has been clever here with its use of colour (or lack of it). With a profile of 178cm x 73cm x 177cm (70” x 28.7” x 69.6”) LWH, this isn’t a small machine by any definition so it’s not too hard to imagine that if it was painted bright orange and fluorescent green it would completely dominate any room it was placed in. The subtle and non-offensive colour scheme probably does quite a lot to reduce the visual impact of this cross trainer which is no bad thing if this machine needs to fit in with the rest of your home. After all, various shades of grey will match pretty much anything! A quick glance at technical information sheet of the C14.9 makes for impressive reading but it’s not just the data that’s impressive. What the data promises here actually translates into reality when using this elliptical. The 15kg (32lbs) flywheel ensures just as smooth a ride throughout the entire cycle as it promises to on paper, making the experience an enjoyable one from the word go. There are no detectable variations in speed as you journey around the ellipse even on the lightest resistance level of the 26 available. It’s completely fluid from start to finish and while we shouldn’t be surprised at this given the manufacturer and the weight of the flywheel, it’s still a very satisfying experience. There’s a 0-20° adjustable powered incline function which makes it possible to change the length of the stride and the shape of the elliptical path that the padded, oversized footplates will take. This incline function enables the user to change the length of the stride from 43cm (17”) to 48cm (19”) while switching seamlessly from a flatter, longer ellipse to a shorter, rounder ellipse. The benefit of this is that not only can the stride be adjusted to suit a particular user, but it can also be changed so as to target different muscle groups allowing for a greater all-around body workout. There are two sets of handlebars, one set fixed and one set moving. The fixed bars help you to target the lower body and house the hand-pulse sensors (though there’s a built-in wireless Bluetooth receiver which we’d strongly recommend if you want to monitor your pulse) while the moving bars have several different grip points enabling the targeting of different upper-body muscle groups. The adjustable footplates and the different grip points on the moving bars also make it easy to get into a very comfortable position on this elliptical, and comfortable it is. All of our testers differ quite a bit in terms of height, weight and shape but everyone was able to find a comfortable position easily and this combined with the near silent and reassuringly stable operation of this cross trainer make the C14.9 a joy to use. It’s smooth, quiet and very comfortable for a wide range of users making it ideally suited to just about any home environment. While NordicTrack might be a little dull (or is that under-appreciated geniuses?) when it comes to colour schemes, nobody should doubt their creativity when it comes to keeping you motivated and pushing yourself to get fit and stay fit. The console on the C14.9 is packed with features to keep you entertained and interested in your workout in a bid to prevent your elliptical from becoming an expensive clothes horse. 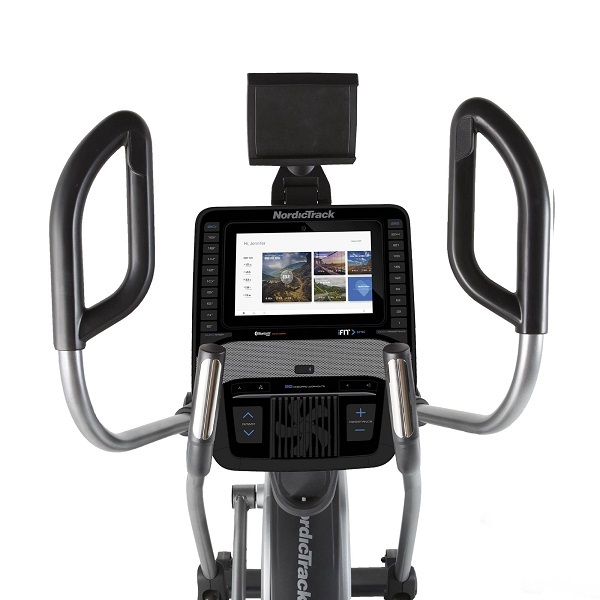 Front and centre is a 10″ full-colour HD touch-screen display through which all the workouts are accessed. And here is where you’ll notice the first thing that really makes this elliptical stand out from a console point of view. There’s a manual mode and you can track your training stats such as speed, calories, distance, time, RPM, incline, heart rate and so on – and that’s where the similarities between this and most other ellipticals end. Where are the cardio programmes, the weight loss programmes, the endurance programmes? Well, they’re gone. Or, not so much gone as thrown out for simply being far too dull! After all, who really gets any enjoyment out of watching a lot of graphs and lights on a screen blink on and off section after section until the end of the workout? Here that entire concept goes out the window, replaced by a vast range of more than 50 engaging, effective and really very enjoyable personal training sessions delivered in HD video. Each video has a specific aim such as a cardio workout, a weight loss workout and so on just like a traditional programme, but instead of a boring graph to stare at, you get a certified personal trainer guiding you and encouraging you throughout the whole workout. This completely changes the nature of the experience as compared with a traditional elliptical and is a massive leap forward when it comes to working out at home. It’s hard to overstate the impact that this paradigm shift has when you’re trying hard to get to the end of a workout as having a personal trainer working out with you and encouraging you to get across the finish line is a different world to seeing bars on a graph slowly blinking away. There’s also a map based workout that’s updated daily that let’s you ‘run’ along a route on a map. It’s all very engaging and really enjoyable. If you take a quick peak at the video below, you’ll see just what a difference this makes. The C 14.9 also comes with a years iFit subscription included, which increases even further the already large number of workouts on this cross trainer. As an iFit subscriber you get the added bonus of being able to map out your own custom routes on Google Maps, even more (an entire library of, in fact) high-definition workout videos led by professional personal trainers, online races against other iFit members and personalised advice for nutrition, exercise routines and sleep schedule. iFit is a whole world unto itself and offers far too much to cover in this review but if you want to know more visit the iFit website for full details. Other features of the C14.9 include workout fan that helps to keep you cool, Bluetooth wireless heart rate receiver, music port and 2″ built-in speakers, water bottle holder and a tablet holder. This last feature provides an additional level of detail as because this elliptical comes with an iFit subscription you can view your training data in iFit while simultaneously participating in a workout video. 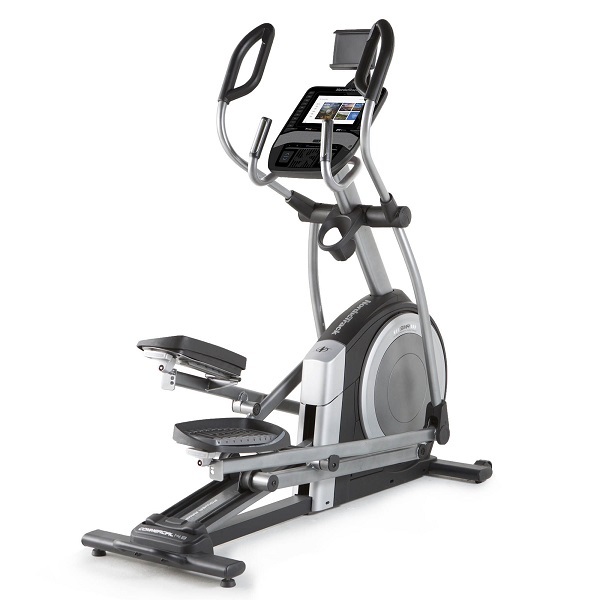 All in all the NordicTrack Commercial 14.9 elliptical is impressive, really very impressive. It’s ergonomically excellent, is easy and fun to use and immerses you in your training in a way that very few other ellipticals can and represents excellent value for money. As such, if you have the space to house it and the budget this really should be at the top of your list. The NordicTrack C14.9 elliptical is big and stable, near silent in operation and very comfortable for just about anyone to use. It's obviously a high-quality bit of kit that's been built to withstand a good deal of heavy use and carries all the hallmarks of a NordicTrack machine. But the bit that really makes this elliptical stand out are those high definition video workouts led by personal trainers. So much more entertaining than staring at a graph they really do help motivate you to push yourself harder and, with an iFit subscription included in the price, the library of available workout videos is increased further making the selection huge. Yes, you need an internet connection to get access to all this stuff, but it's soooo worth it. The combination of excellent build quality and innovative, useful features, makes this cross trainer easy to recommend.